Unfortunately, stories like mine are common among many LGBTQ students. Reportedly, 58 percent of LGBTQ students feel unsafe at school because of their sexual orientation, and 43 percent because of their gender expression. Additionally, it is important to realize that bullying against LGBTQ students is an intersectional issue that is informed by other identities. For example, 53.1 percent of LGBTQ students of color feel unsafe at school because of their sexual orientation. Furthermore, on average, students of color experience more verbal harassment, physical harassment, and physical assault because of their gender expression than their white peers. What is particularly upsetting is that 85 percent of LGBTQ students report being verbally harassed, but a staggering 64 percent who report an incident say that school staff did nothing in response or were told to ignore it. This #SpiritDay, I wish to amplify the voices of students like me who have been bullied for being their true selves. Moreover, I want to urge teachers, family members, and non-LGBTQ students to practice active allyship by taking action when bullied students report instances of violence. Finally, I hope that we within the LGBTQ community are able to look at bullying through an intersectional lens so as to understand the ways in which other identities—such as class, race, ability, and religious background—shape experiences with bullying differently for individuals within the community. 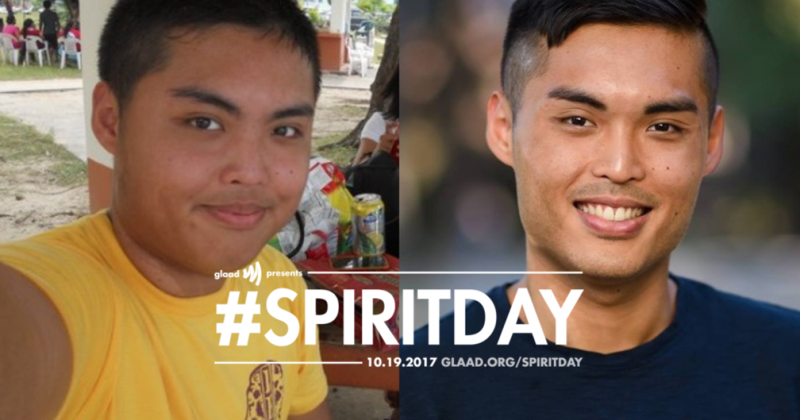 Matthew Choi Taitano is a founding GLAAD Campus Ambassador and a senior at Princeton University. Throughout his time at Princeton, Matthew has been engaged in leadership and activist work around issues impacting LGBTQ students, students of color, and students from first-generation, low-income backgrounds. Join Matthew and take the Spirit Day pledge now!